The Caribbean is treasured and revered globally as one of the world’s most biologically diverse regions, with more than twelve thousand marine species, ten per cent of the world’s coral reefs, and fifteen thousand plant species. But the last quarter century has seen significant damage to our natural environment, as a result of increased industrialisation and automation, the use of chemicals and toxins, and consumption of commodities like plastics, electronics, appliances, Styrofoam, meat, and packaging. Fortunately, the Caribbean has also made huge strides in raising awareness of the effects our human activities are having on our once-pristine waters, as well as our air, land, and wildlife. Across the region, more of our people are beginning to comprehend the true extent of the vulnerability of our coastlines and the mounting threats they face, particularly climate change. Ocean warming and acidification have contributed to a dramatic loss of coral reefs, which are invaluable habitats for fish and other marine life. “We are seeing so much contamination of our water, air pollution — and flooding is becoming more frequent because of natural disasters, so there is greater awareness by politicians and decision-makers about environmental issues,” explains Christopher Corbin, programme officer for the Caribbean Environment Programme. CEP was established by the United Nations Environment Programme (UNEP) in 1981, within the framework of its Regional Seas Programme. As our regional economists better comprehend the effects of environmental accounting, we are seeing the private sector make an effort to incorporate practices such as reusing waste water and cutting down on packaging. It’s simply not in their interest to have a dirty beach, polluted waters, or dead reefs. But “the industrial land-based private sector still needs a lot more work,” Corbin says. Governments have a very important role to play — by offering certain incentives to undertake pollution prevention measures, such as retrofitting factories and implementing disincentives to waste production. While it’s imperative to find economic opportunities for our people, in the face of limited resources, high debt ratios, and vulnerabilility to natural disasters, much can be done by focusing on the type of development agenda Caribbean countries subscribe to, Corbin believes. And, he says, our governments are beginning to articulate their interest in a “blue economy” and a “green economy.” “We are seeing a new kind of thinking,” he says. “What we need now are land use development plans that maximise what developed countries have already started to do — urban farms, clean energy, etc. We need to be more open and imaginative, but we also need to have better enforcement of laws that protect the environment.” If policies aren’t enforced, Corbin says, it’s not going to work. Considering the big-picture question of climate change, Donna Blake, the Nature Conservancy’s Jamaica programme director, is hopeful. “Governments and communities are taking action to proactively address the challenges of climate change,” she says. She points out that at the regional level the establishment of the Caribbean Community (CARICOM) Climate Change Centre, which focuses solely on climate change education and adaptation projects, is a noteworthy advance. The Nature Conservancy itself has designed programmes to work with coastal communities facing climate-related risks. “At the Water’s Edge,” a collaborative project with the International Federation of the Red Cross, builds resilience in communities in Grenada and St Vincent and the Grenadines by empowering people to assess the social, ecological, and economic risks of climate change, and make informed decisions about how to use their resources sustainably. 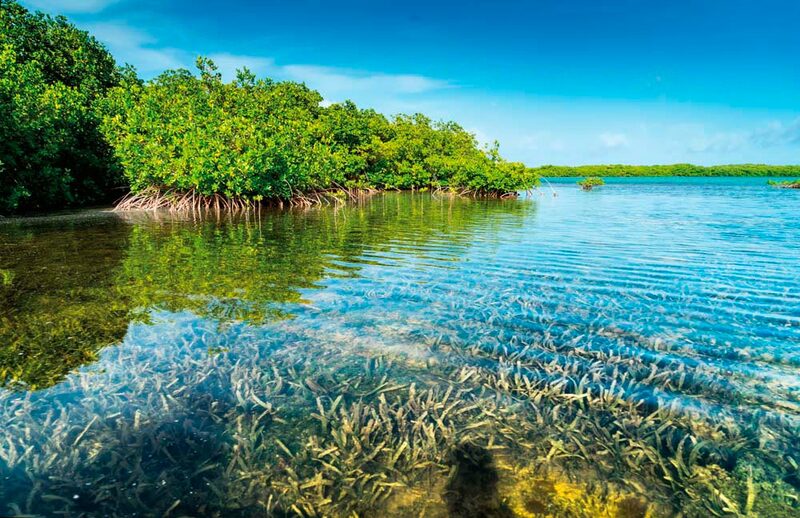 The initiative provides decision-making tools and training for nature-based climate resilience strategies, such as coastal mangrove restoration.